Molten Salts and Ionic Liquids: Never the Twain? For many years, the related fields of molten salts and ionic liquids have drifted apart, to their mutual detriment. Both molten salts and ionic liquids are liquid salts containing only ions - all that is different is the temperature! Both fields involve the study of Coulombic fluids for academic and industrial purposes; both employ the same principles; both require skilled practitioners; both speak the same language; all then that is truly different is their semantics, and how superficial is that? 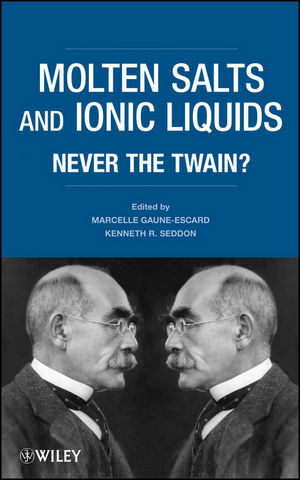 The editors of this book, recognising that there was so much knowledge, both empirical and theoretical, which can be passed from the molten salt community to the ionic liquid community, and vice versa, organised a landmark meeting in Tunisia, designed to bridge the gap and heal the rift. Leaders from both communities met for a week for a mutual exchange, with a high tutorial content intermixed with cutting edge findings. This volume is a condensate of the principal offerings of that week, and emphasises the success which was achieved. Indeed, four future biannual meetings, under the title of “EUCHEM Conferences on Molten Salts and Ionic Liquids”, have now been planned as a direct result of this meeting of minds. Topics discussed in this volume include structure, dynamics, electrochemistry, interfacial and thermodynamic properties, spectroscopy, synthesis, and theoretical studies. Experimental and theoretical methods for investigating these data are elaborated, as are techniques for data collection and analysis. This book represents the first serious discussion on the transfer of these methods and techniques between the differing temperature regimes, and is a major contribution to the future of both fields. Kenneth R. Seddon is a professor in the School of Chemistry at the Queen's University of Belfast, Northern Ireland, since 1993. Professor Seddon is Chair of Inorganic Chemistry since 1993 and director of QUILL (Queen's University Ionic Liquid Laboratories) since 1999. Professor Seddon's Research Interests include green chemistry, crystal engineering, ionic liquids for clean technology, phosgene, coordination chemistry and conservation of pre-tenth Century Chinese paper. ?He holds a B.Sc. (1970) and Ph.D. (1973) in Chemistry from the University of Liverpool, UK and MA (1974) from the University of Oxford, UK. 1 Ionic Liquids in the Temperature Range 150-1500 K: Patterns and Problems (C.Austin Angell). 2 Conductivities of Ionic Liquid Mixtures with Organic Electrolyte Solutions (D. Bansal, F. Croce, J. Swank and M. Salomon). 3 How Hydrophilic Ionic Liquids Behave in Aqueous Solutions (Marijana Blesic, Kenneth R. Seddon, Natalia V. Plechkova, Nimal Gunaratne, António. Lopes and Luís Paulo N. Rebelo). 4 Mass Spectrometry Studies on Ionic Liquids Aggregates (R. Lopes da Silva, I. M. Marrucho, J. A. P. Coutinho and Ana M. Fernandes). 5 Study of the Sm-Al Alloys Formation in the Molten LiCl-KCl Eutectic (G. De Córdoba and C. Caravaca). 6 Alumina Solubility and Electrical Conductivity in Potassium Cryolites with Low Cryolite Ratio (Alexander Dedyukhin, Alexei Apisarov, Olga Tkatcheva, Yurii Zaikov and Alexander Redkin). 7 Ionic Liquids as Solvents for the Variable Temperature Electrodeposition of Metals and Semiconductors: A Short Introduction (S. Zein El Abedin and F. Endres). 8 Predicting the Thermodynamic Behaviour of Water + Ionic Liquids Systems Using COSMO-RS (M. G. Freire, L. M. N. B. F. Santos, I. M. Marrucho and J. A. P. Coutinho). 9 Metallic Inert Anodes for Aluminium Electrolysis (I. Galasiu, R. Galasiu and C. Nicolescu). 10 The Behaviour of Phosphorus and Sulfur in Cryolite-Alumina Melts: Thermodynamic Considerations (I. Galasiu, R. Galasiu, C. Nicolescu, J. Thonstad and G. M. Haarberg). 11 Ionic Liquid - Ionic Liquid Biphasic Systems (Dirk Gerhard, Friedrich Fick and Peter Wasserscheid). 12. Recent Developments in the Reprocessing of Spent Fuel by Catalyst Enhanced Molten Salt Oxidation (CEMSO) (Trevor R. Griffiths, Vladimir A. Volkovich and W. Robert Carper). 13 Plasma-Induced Molten Salt Electrolysis to Form Functional Fine Particles (Yasuhiko Ito, Tokujiro Nishikiori and Takuya Goto). 14 Liquid Electrolytes: Their Characterisation, Investigation and Divers Applications (Keith E. Johnson). 15 Protection of a Microstructured Molybdenum Reactor from High Temperature Oxidation by Electrochemical Deposition Coatings in Molten Salts (S. A. Kuznetsov, A. R. Dybrovskiy, S. V. Kuznetsova, E. V. Rebrov, M. J. M. Mies, M. H. J. M. de Croon and J. C. Schouten). 16 Molten Salt Synthesis of LaAlO3 Powder at Low Temperatures (Zushu Li, Shaowei Zhang and William Edward Lee). 17 Accurate Measurement of Physicochemical Properties on Ionic Liquids and Molten Salts (V. M. B. Nunes, M. J. V. Lourenço, F. J. V. Santos, M. L. S. M. Lopes and C. A. Nieto de Castro). 18 Molten Salt Physics and Chemistry in the Current Development of Spent Nuclear Fuel Management (Toru Ogawa, Kazuo Minato and Yasuo Arai). 19 An Organic Chemist’s Perspective on High Temperature Molten Salts and Room Temperature Ionic Liquids (Richard M. Pagni). 20 Raman Spectroscopy of High-Temperature Melts (G. N. Papatheodorou, A. G. Kalampounia and S. N. Yannopoulos). 21 Thermodynamic Properties of LnI3-MI binary systems (Ln = La or Nd ; M = K, Rb, or Cs) (Leszek Rycerz, M. F. Butman and Marcelle Gaune-Escard). 22 Materials Informatics for Molten Salts Chemistry (Changwon Suh, Slobodan Gadzuric, Marcelle Gaune-Escard and Krishna Rajan). 23 A Novel Ionic Liquid-Polymer Electrolyte for the Advanced Lithium-Ion Polymer Battery (Daisuke Teramoto, Ryo Yokoyama, Hiroshi Kagawa, Tsutomu Sada and Naoya Ogata). 24 Solubility of Al2O3 in NaCl-KCl Based Molten Salt System (Y. Xiao, C. R. Mambote, G. A. Wierink and A. van Sandwijk). 25 Molten Salt Synthesis of Ceramic Materials (Shaowei Zhang, D. D. Jayaseelan, Zushu Li and William Edward Lee). 26 Fuel Cell and Electrolysis Studies with Dual Phase Proton and Oxide Ion Conduction (Bin Zhu, S. Li, X. L. Sun and J. C. Sun).